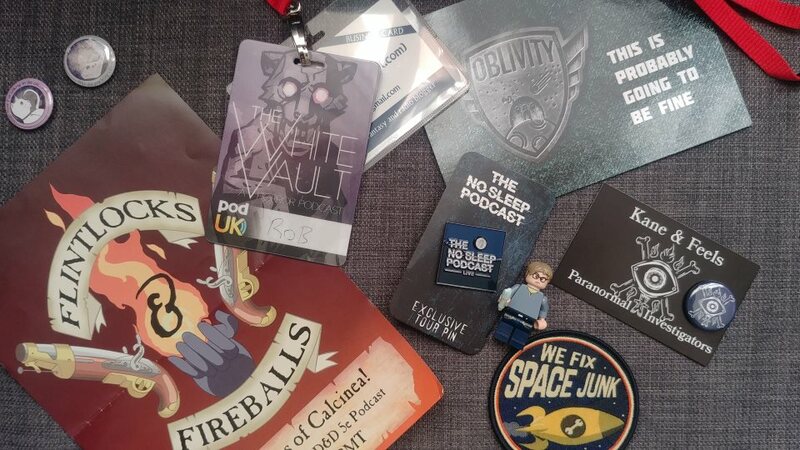 Since I waffle on about podcasts quite as much as I do, I felt it would have been rather remiss of me to not attend the first convention dedicated to them in the UK. Hideously late on a Friday evening then, I found myself on a train heading Oop North (okay Midlands) for PodUK. This was a day of events in Millennium Point, dedicated solely to the art of putting audio out via the internet. 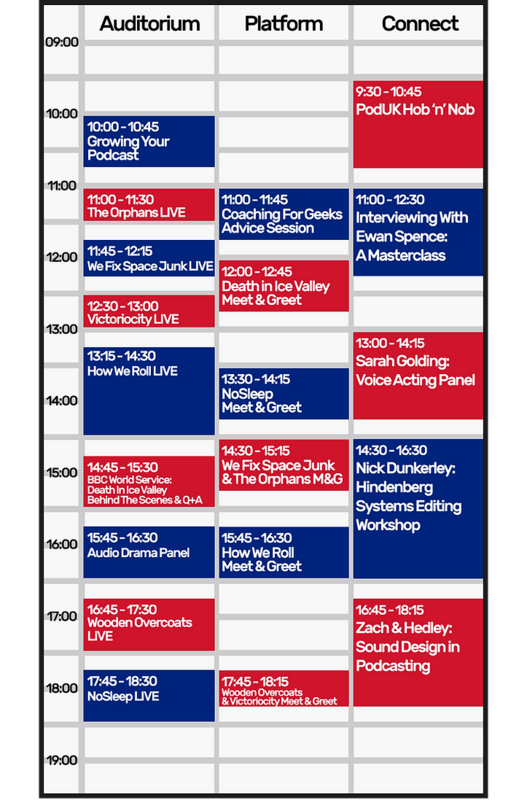 It turned out to be a very audio drama focused day, though I don't know if that was intentional or just how it fell out. Events were divided up by the spaces that contained them. The main auditorium featured live shows and a couple of bigger panels. The smaller general "con space" was utilised for meet and greets of groups of approx. 15 with various creators, and a side meeting room was used for panels intended to be more directly instructive. As someone more prone to typing than speaking, I spent the majority of the day in the auditorium, so I will leave opinions on the instructive stream to those better suited. For those interested, the overall schedule. First panel of the day was "Growing your podcast", chaired by Robin Bates of Coaching For Geeks, with Sarah Golding, Ewan Spence and Ella Watts. This covered how they first got into podcasting, the biggest challenges they've faced, and the best ways to grow your audience. Golding spoke of the value of a show reel, and the necessity of simply shopping it round to all of the people you might be interested in working with. She worked her way around various podcasts while still teaching, and eventually managed to make it full time, by constantly pushing to expand. Watts had a path that seemed increasingly familiar as the day went on, starting off in radio (student and community) and then discovering that online audio was a thing you could do yourself, with a relatively low barrier to entry. This was a comment I heard a few times, with evidently most people being aware of radio first (because it's everywhere) and realising they could do it themselves. Spence had a nice viewpoint, having been involved in The Podcast Network since 2005, and having made things and then passed them on to other hands. The general message was one of the need for persistence. And having things to show people you exist. There was a discussion about knowing and reaching your audience. There are very many different platforms available for podcast distribution, and you need to be on all of them. If people only use one particular app, and your show isn't available there, you're missing a significant market. Availability is important, but requires boundaries. Being approachable on social media is a great way of convincing fans to pay more attention (and hopefully give you money), but it always needs monitoring for inappropriate behaviour. If possible, look into delegation of some of these tasks, so you don't get all the emotional work of dealing with people. The Amelia Project was held up as a great example of audience-friendly branding, with their constant references to cocoa giving that association with a common dopamine hit, and giving something fans can rally around. They also do a similar thing with Maltesers, which works well. 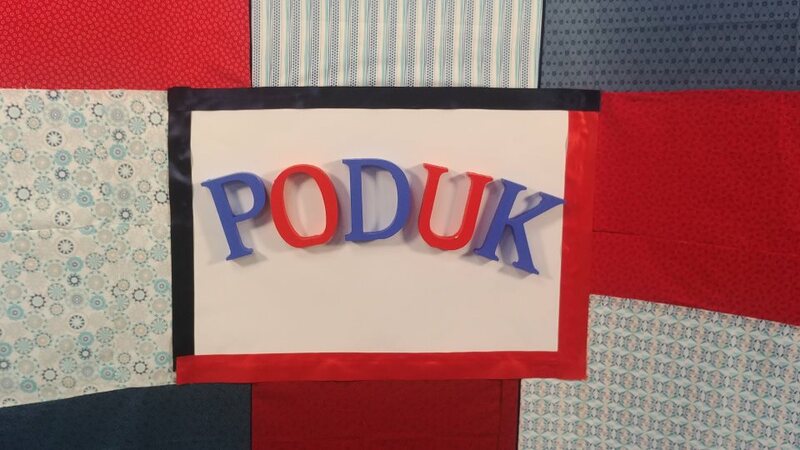 While there was a general feeling that the audio drama space was both friendly and supportive, it was recognised that it could be somewhat insular. It's a niche within podcasts, and in order to see bigger growth, it has to get out of that bubble. Genres such as true crime are getting download numbers that dramas can't even imagine (occasional outliers like Night Vale notwithstanding), and bringing people across from non-fiction to fiction should be part of a growth plan. There's also the possibility of chasing out for crossovers into other media, such as youtubers and twitch streamers. There's already an actual-play category on Twitch for instance, and people watching those streams may well have an interest in scripted works. And the slightly more unconventional suggestion of Mumsnet. The value of talking to other podcasters was also highlighted. Many people are filling multiple roles, and you never know who you can swap skills with. It's possible you can help someone out (or know someone who can) in return for assistance on your own project. (With the ever-present spectre of none of this potentially being paid, if you're just starting, or running it as a hobby.) The Audio Drama Hub Facebook Group may also be helpful. Audience questions were taken with a massive throwable microphone, which everyone involved seemed to coo over. These covered how best to promote a new podcast and what the effect of corporate interests is likely to be. Suggestions included promoting everywhere, especially Twitter with the usual #AudioDramaSunday, #AudioDrama and #BritPodScene. Though apparently you should post after 3pm GMT when all the Yanks are awake. Other suggestions include good graphics to grab the eye (even though it's an audio medium, people will see your picture first), and have a trailer, so you can check that your RSS feed is working before you start telling people about a new series. The feeling about corporates was that a "rising tide lifts all boats", in that if huge numbers of people are driven to the medium, they will also go looking for the indies. Just beware of all the complications around IP, and make sure that if large companies get involved, money comes through to the people making the work, since the companies are obviously trying to turn a profit, and shouldn't do that from free labour. The corporate question does make me think about how this is going to scale up. There was obviously a degree of sponsorship from Hindenburg, but the turnout of about 150 may or may not translate into sufficient return. This is where I think it would need to spread out into non-fiction to see significant growth. I did speak to a number of fans, but I would be tempted to say the majority were either already creators or intending to become creators. Whether this can be scaled up to a "fan"-convention is unknown. Or indeed whether it should. Since I'm terrible at photos, have some tiny ones that hide some of the pixels. Live shows I attended included The Orphans, We Fix Space Junk, Victoriocity, How We Roll and Wooden Overcoats. (To my shame, I missed No Sleep, having got caught chatting to creators in the general space. More on that below.) These were of course, all rather brilliant. I have to give top place to We Fix Space Junk, mostly because they seemed to be having so much fun with it. A certain amount of scripted audience participation gave an excellent meta nature to an episode already set in a convention (filled with parasites trying to take control of "influencers"), and had an absolutely perfect riff on the "This is more of a comment..." question. Nice little snippet of the new series of Victoriocity, which I am now looking forward to even more, and How We Roll was entertaining primarily because since they had a very strict time limit, everyone was determined to get to the end of the game as soon as possible. Whatever that took. (Dynamite was included.) Definitely amusing that some of the biggest laughs/cheers were for dice rolls. Wooden Overcoats did various snippets of several shows, and The Orphans did three mini stories, further expanding the universe. There was also a drop-in by the BBC, giving a bit of an insight into Death In Ice Valley. This is true crime, and I was curious to see a bit more of the background to that, where you're dealing with things that actually happened. They offered suggestions on social media control - turn off comments if you're not around to moderate them, which I hadn't even realised you could do. Their concept however did very much tie the audience into helping solve the mystery, doing effectively a crowd search by replicating long-term researchers with short-term masses of people. This is something that I think is probably quite a fun idea to bring across to audio drama. And naturally, it's already been done. There are a few different interactive audio dramas. Still, possibly room for more, though perhaps best suited to an improv styled group? There was a slight edge of snobbery that briefly shone through, when they were discussing quality of soundscape, compared to the more "bare ones shown during the day". Not a fair comparison, given the scale of money involved, but I think that's a boundary slowly weakening over time. They did however make use of the enormous screen for a bit of audiovisual, which was a clever move. Most personally amusing moment was just how many people I managed to end up talking to that either lived nearish Cambridge or went there. The world is very small, and only getting smaller. In terms of the venue, wasn't a bad space for the current scale. There was an unfortunate tendency for announcements to reverberate through the auditorium, and I suspect it would have been preferable for the meeting room set aside for the smaller panels to have been a bit larger (again, wasn't in them, it just felt small during the initial meet-n-greet. Feel free to correct me.) 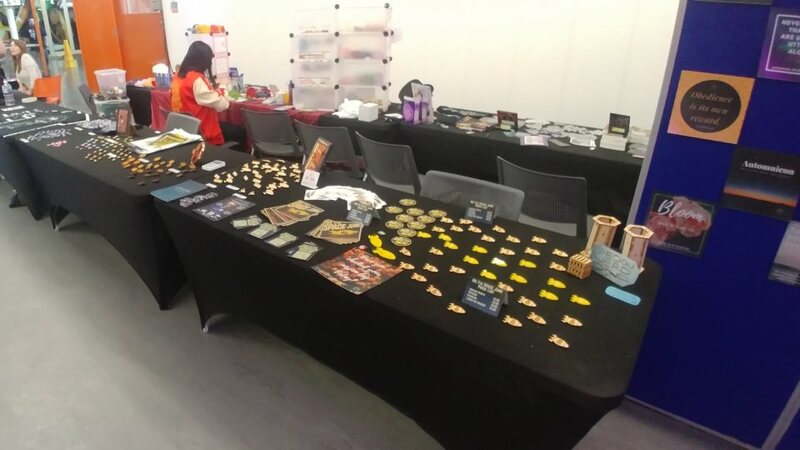 Nice to see cross-working in the mingling area, with people curious about the various merch on sale, and what they would like to be producing themselves. 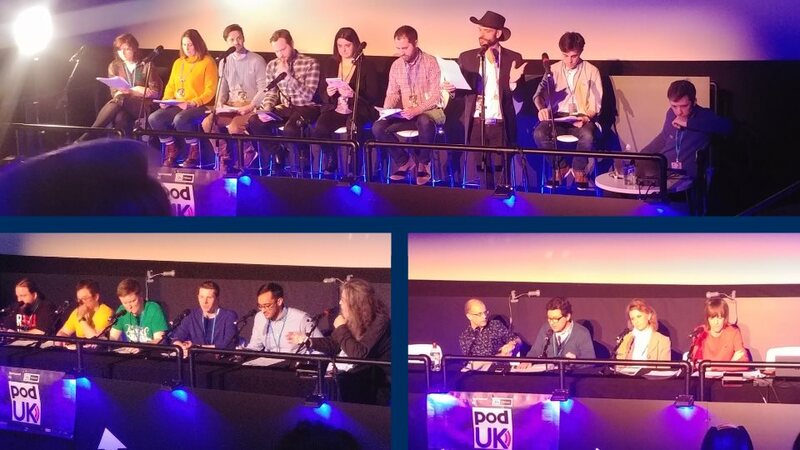 Finally, the audio drama panel, chaired by Ella Watts grabbed creators of the shows presented during the day, as well as others, and was probably the jolliest panel, with enough sparkling dialogue of its own to match a few of the performances. I'm led to believe they were all recorded, but not currently sure where/if that's available. If it is, definitely give it a watch. My tip for the next one? If you're there as part of a creator team, come bedecked in your own merch. It makes you very easy to spot, and gives people an easy in. Most impressive version of this was the We Fix Space Junk jumpsuits. If you have no merch, feel free to stick a flyer to your lanyard. Pleasingly obvious. And I now suspect badges will act as this world's bottle caps in our Fallout-style nuclear holocaust.